BIC team Dr. M. Jahangir (Director ORIC), Dr. Rehmat Zaman (Manager BIC), Dr. M. Mumtaz Khan (HoD Public Health) and Ms. Neelam Akhtar (Executive Training Associate) along with incubates participated in L.I.F.T Pakistan International Conference on November 14-15, 2018. The University of Haripur exhibited in the conference along with various other global (University of Bradford) and local universities (9 Universities). Dr. M. Jahangir was the keynote speaker in Edtech conference. Our startup Gas leakage detector participated in Business plan competition. To improve the image of Pakistan globally as a country full of opportunities. 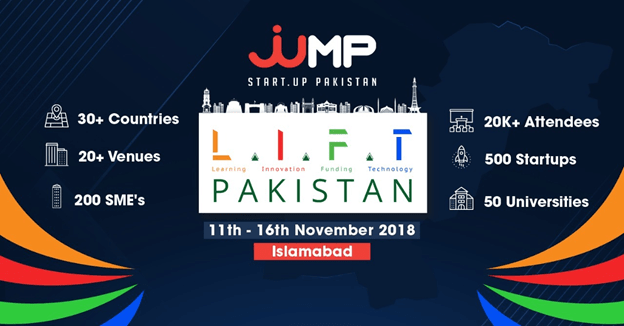 To promote Entrepreneurialism so that Pakistan could become economically independent and to realize it`s potential through helping young people in Business, growing existing businesses and connecting them with oversees Pakistani Businesses. Presenting investment opportunities in Pakistan for local and global investors. Bring about rule of law in every aspect of Pakistani Life.